"I was 17 years old at the time and the dress made me feel so grown up and beautiful," Pauline "Polly" Carver Duxbury wrote about the dress she wore to her 1967 debutante ball. "It is in my mind the most beautiful dress I have ever seen." Debutante ball gowns, prom dresses, quinceañera gowns : the outfits we wear for special occasions often hold a special place in our memory. However, Polly Duxbury's debutante dress is more than just special to Duxbury—it is part of American history because of the person who created it. 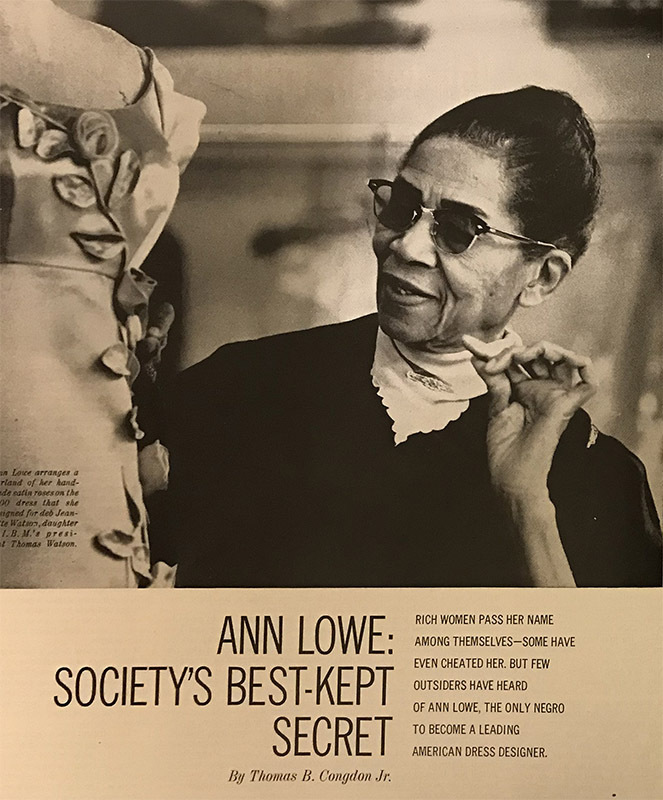 The dress was designed by Ann Lowe, an acclaimed African American dress designer who was happiest when she created in cloth. "All the pleasure I have had, I owe to my sewing," Lowe told a reporter for Ebony in 1966, "I wish I were physically able to do all the work myself." Dressmaker, designer, seamstress, couturier, businesswoman: all are terms that could describe Ann Lowe. Each term holds a specific connotation—both today and in the first part of the 20th century, when Lowe was working. We have chosen to use the words "dressmaker" and "designer" in this piece because they best describe Lowe's work envisioning the gowns and helping to create them. Even when Lowe's eyesight failed, she still designed dresses. Unlike some of the most modern uses of the word "designer," Lowe did not design ready-to-wear lines for her store or others. This 1964 Saturday Evening Post article profiled Ann Lowe, calling her a "dress designer." Photograph courtesy of the author. Born in Clayton, Alabama, in 1898, Ann Lowe (née Cole) was the daughter and granddaughter of accomplished seamstresses. "She learned from them," said curator Nancy Davis. "She was really gifted, but she was also part of this lineage of seamstresses . . . and really capable ones." When Lowe was a child, she loved to play with the scraps left over from her mother's work, sewing and shaping them to transform them into flowers. 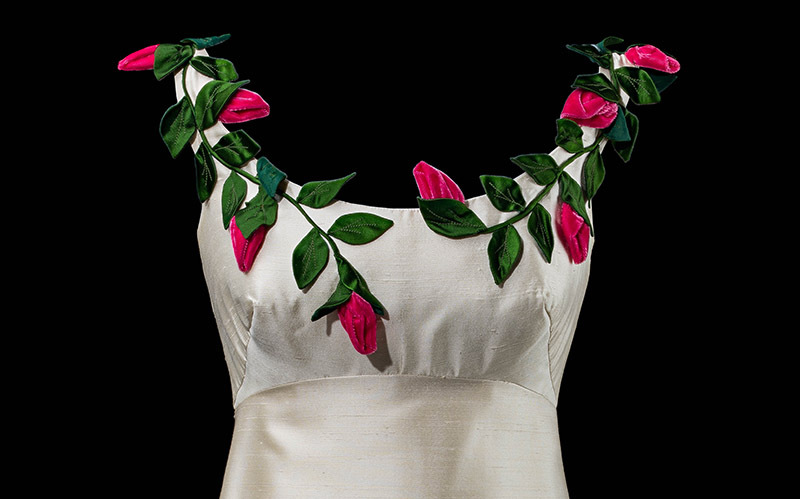 As a child, Ann Lowe would transform the scraps from her mother's work as a dressmaker, sewing and shaping them into flowers. Years later, flowers would be a hallmark of an Ann Lowe dress. One debutante brought her dress to Lowe for repairs when her date snipped a flower off of the dress and wore it as a boutonniere. In 1914, when her mother died suddenly, young Ann Lowe, only 16 years old, completed her mother's commissions—including one for the First Lady of Alabama. Lowe continued to pursue her passion for design and sewing. When a wealthy Floridian invited Lowe to Florida to make dresses, Lowe recalled "I picked up my baby and got on that Tampa train." In 1917 Lowe studied at New York's S.T. Taylor Design School. With racial segregation the common practice even in the North, Lowe "was separated from the other students and had her own space where she worked," Davis said, "but her work was so exceptional that she was used as an example." After earning her diploma, Lowe continued to work as a designer for the social elite. "I love my clothes and I'm particular about who wears them," Lowe later told Ebony magazine, "I am not interested in sewing for . . . social climbers. I do not cater to Mary and Sue. I sew for the families of the Social Register." Lowe's clients included the du Ponts, the Roosevelts, the Rockefellers, and the Auchinclosses (famous today for family member Jacqueline "Jackie" Bouvier, better known as First Lady Jacqueline Kennedy Onassis). Mrs. Auchincloss brought her daughter Lee Bouvier, Jackie's sister, to Ann Lowe to order her wedding gown. However, Lee and her mother soon canceled the order. They heard another designer, Pauline Trigère, would cost less. Ultimately the Trigère dress cost more, and when Jackie announced her engagement to then Senator John F. Kennedy, it was Ann Lowe who designed the bridal gown, as well as dresses for the bridal party. 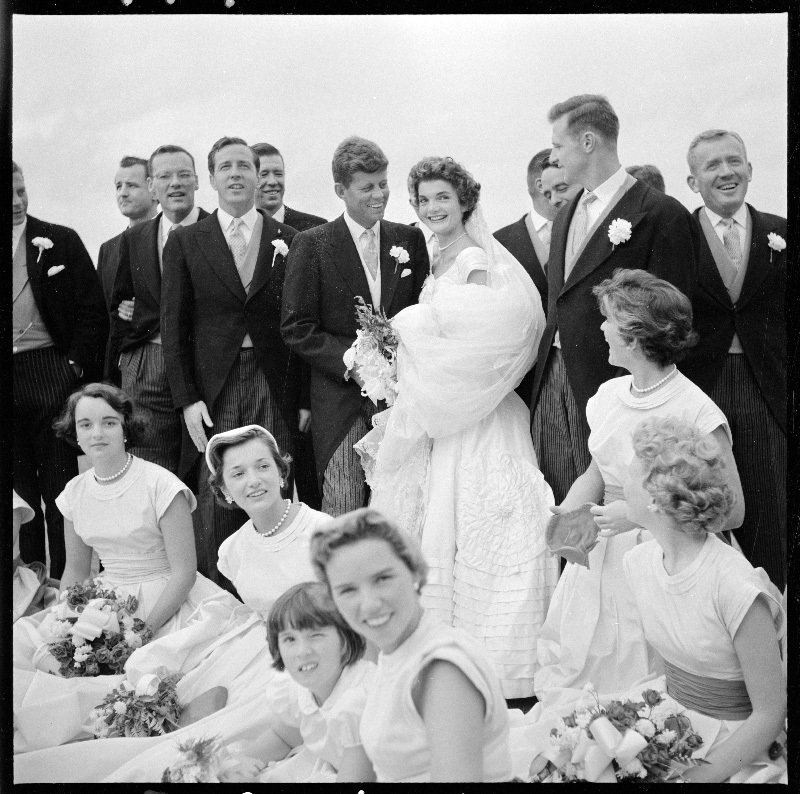 The newly married Mr. and Mrs. Kennedy with members of their wedding party in 1953. Lowe designed both the bride's gown and the attendants' gowns. 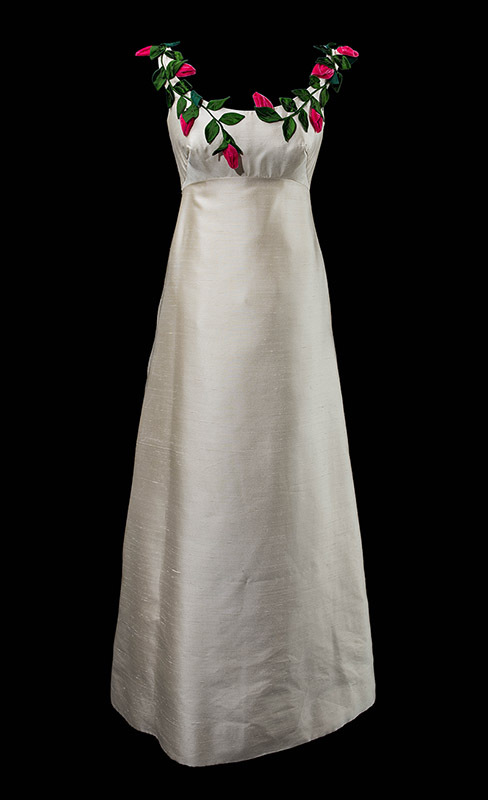 Jackie Kennedy’s wedding dress features trapunto. "Trapunto is a layering of fabrics to create a dimensional effect—it was a technique Lowe was well known for," Davis said. Photograph by Toni Frissell, courtesy of Library of Congress, Library of Congress Prints and Photographs Division. A week before the Kennedy wedding, Lowe's workroom flooded, ruining 10 of the 15 gowns, including the wedding dress. Lowe and staff worked around the clock for a week to remake the dresses. The wedding gown originally took eight weeks to make—it was duplicated in five days. After repurchasing all the fine fabric, and working day and night, Lowe's projected $700 profit on the job was actually a $2,200 loss. Lowe never told the family. When Lowe arrived in Newport, Rhode Island, to deliver the bridal party's dresses, the staff at the front door would not let her enter, telling her to use the back door. Lowe reportedly countered, "I'll take the dresses back" if she had to use the back door—and walked through the front door. While a poorly timed flood wasn't typical for Lowe, the dramatic story of the Kennedy wedding gives us a window into Lowe's daily struggles. Lowe's prices were lower than her competitors'. Lowe's son, Arthur, helped her manage the business. After he died in a car accident in 1958, making ends meet became a struggle. "Too late, I realized that dresses I sold for $300 were costing me $450," Lowe said. She ended up owing money to friends, to suppliers, and to the IRS. "The Internal Revenue agents finally closed me up for non-payment of taxes. At my wits end, I ran sobbing into the street," Lowe said. In 1962 she declared bankruptcy. Someone anonymously paid Lowe's IRS debt. Many believe it was Jackie Kennedy—who would have discovered both the dramatic story of completing her wedding dress and Lowe's financial struggles. Lowe picked up her sketchbook and went back to work. During her career, Lowe had her own label and a store on 5th Avenue. She worked for designer Hattie Carnegie. Her dresses were sold in Neiman Marcus, Henri Bendel, and Saks Fifth Avenue. At Saks, Lowe became the head designer of The Adam Room, a special in-house boutique that catered to the social elite. It was there that Polly Carver Duxbury ordered an Ann Lowe dress for her debutante gown. 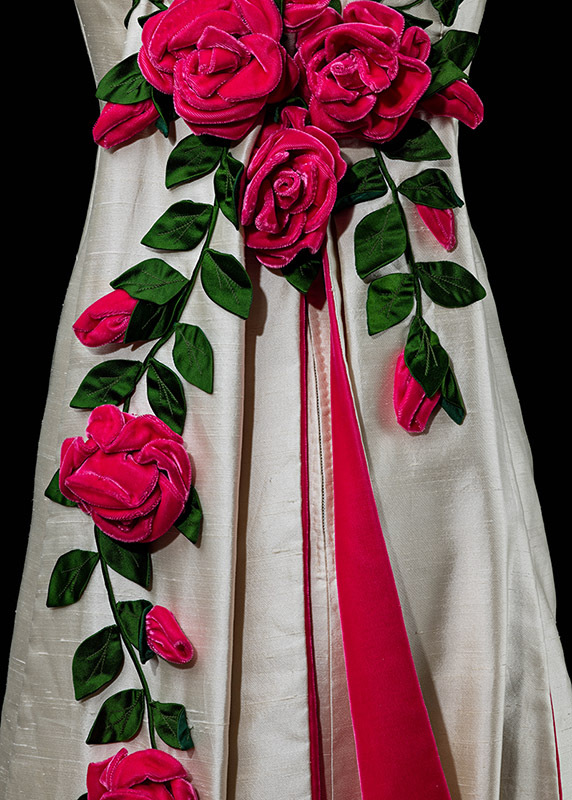 A detail of the dress Lowe designed for Duxbury. "The quality of this dress? Unbelievable," said curator Nancy Davis. "All the seams are lined with lace. There's an amazingly complex interior structure that the dress is built around—the slip and bra are built in. According to Polly Duxbury, the fit is absolutely glorious—it's like your skin. The slip has tulle along the hem, which gives it shape. This kind of really detailed, really high-end work is very time-intensive." Looking at the interior of the dress, one can better understand why Lowe was so sought-after, and why she struggled financially. "Everything is so perfect—and she didn't charge enough for the cost of the fabrics or the handwork that went into them," Davis said. "Sewing was her lifeblood. It was her gift, but also her being. She just wanted to sew. She just wanted to make beautiful dresses that gave her clients joy." Indeed, Lowe told a reporter for the Saturday Evening Post in 1964, "I like for my dresses to be admired. I like to hear about it—the oohs and ahs as they come into the ballroom. Like when someone tells me, 'the Ann Lowe dresses were doing all the dancing at the cotillion last night.' That's what I like to hear." Ann Lowe's story brings to mind Elizabeth Keckley, an African American dressmaker for the elite in the mid-1800s. Keckley used her earnings as an accomplished seamstress to purchase her freedom, and that of her son. She went on to create dresses for Washington, D.C., high society, including First Lady Mary Todd Lincoln and Mrs. Mary Anna Custis Lee. A christening gown created by Keckley is currently on display in American Enterprise. Nancy Davis is a co-curator of the exhibitions Many Voices, One Nation and American Enterprise. She is a curator emeritus in the Division of Home and Community Life at the National Museum of American History. Amelia Grabowski is a social media and blog assistant focusing on business and philanthropy history.